It’s been recently published by University of Adelaide a study that focuses on the application of artificial intelligence in diagnostic field, with the aim of determining who, among the subjects involved, has major probabilities of decease in a temporal horizon equal to 5 years (https://www.nature.com/articles/s41598-017-01931-w ). Far beyond simplistic gruesome consideration one may easily express, the goal of the research is set to be the prevention of non-immediately detectable pathologies that still during the years evolve damaging human body and bringing finally to death. In this context AI use finds its place, in particular exploiting deep learning algorithms, thanks to which comparisons have been made over a wide database of information regarding patients: not only tomographic images, but also data about clinical history. Analysis coming from new models provided predictions with greater accuracy with respect to radiodiagnostic techniques, showing AI potential in medical diagnostic field. By the way, in Ab.Acus we support the importance of deep learning implementation in biomedical scope, nevertheless our research works are permeated also by a marked attention to the elders’ life conditions, in the perspective of their continuous improvement and pathologies prevention. The latest example is the European project H2020 MoveCare (http://www.movecare-project.eu/) coordinated by prof. Alberto Borghese from University of Milan, where artificial intelligence is used for monitoring the elders at home. Starring of MoveCare is a hierarchical platform including various actors’ participation: it’s created an activity center whose task is helping the elder to follow a healthy life style, involving him/her in social and cognitive activities; to assist it, there is a virtual community that has the goal to encourage the elder’s integration in his/her foremost natural social fabric, starting from family and friends, aiming at counteract isolation; it is fundamental the presence of a Virtual Caregiver, that is a system analyzing data provided by monitoring equipment, exploiting artificial intelligence and machine learning and proposing the elder customized tips about activities to perform, as well as providing assistance for all aspects of everyday life. The system is able to detect environment information, providing support and stimulating the elder to a healthy and active life style, thanks to the presence of an assistive robot. The elder does not have to wear any device, but in everyday use objects sensors are installed (we talk about sensorised objects), able to collect information about mobility and to send them in real time, so that they can be analysed. A further tool for monitoring comes from home automation sensors able to analyse the elder’s lifestyle and behavioral habits, in order to anticipate and detect a possible decline in cognitive functions. One of the strengths of the project is certainly the idea to let the elder live in his/her own house, that means in a well-known and reassuring place, where the elder can keep and strengthen his/her social connections, starting from the family. But what’s really innovative in MoveCare? “For sure the creation of a new standard for home assistance to the elders, incorporating characteristics that were absent in preexisting commercial assistance programs. 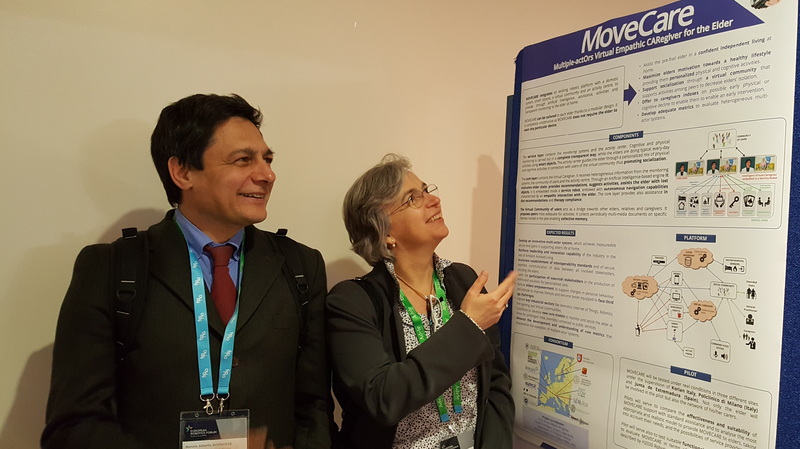 In addition to this, MoveCare platform deals with the problem of aging in a unique way, at 360°”: that’s what says Brunella Marzolini, one of our researchers involved in MoveCare project. “What is the characteristic of the project that attracts you more?” we ask her, “Without any doubts the “social” part”, she replies, “that is the possibility that even for non-digital native users new media are exploited, readapting them and with the maximum customization. This gives the elder the chance to be in contact with family and friends, preventing isolation”. As natural consequence of its constitutive characteristics, the system implemented by MoveCare plays an important role in the perspective of preventing the development of diseases related to ageing and, hopefully, improving the results of predictions provided by deep learning algorithms of Adelaide University. Certainly, clinical history and previous pathologies are fundamental in determining life expectation, but you cannot disregard the socio-environmental context where the elders live, their habits and psychological impact on the general person’s well-being.